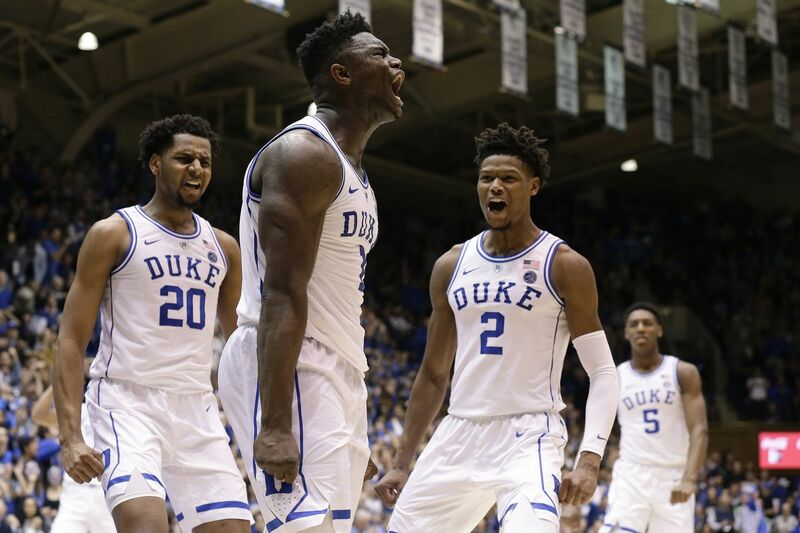 CHARLOTTESVILLE, Va. -- This heavyweight fight ended with a little celebration, Cam Reddish and Zion Williamson chest-bumping, the third Duke super-freshman, R.J. Barrett, joining for a group hug. Let’s face it, those three committed to Duke together for nights like this. You can make the argument that if Reddish were playing for any other school, he’d be the guy getting all the attention. Let’s make a different argument, that this is perfect for him. Devote proper attention to Williamson and Barrett -- Saturday night, facing Virginia in John Paul Jones Arena, the first game this season that maybe Duke wasn’t supposed to win, LeBron in the front row right under a basket -- and Reddish stood ready. The rankings are what they are, and they say Tennessee is No. 1, but Duke’s two wins over otherwise-unbeaten Virginia mean the Blue Devils are on top of college hoops. An early Barrett spree got Duke up, but the Cavs came alive just before halftime. Duke was going to need to win the second half, too. A Reddish three, and, two possessions later, another. Then, his third in a row -- 5 of 7 overall, 17 points in 21 minutes, Duke up 52-41, eventually winning 81-71 as a Norristown kid, a Westtown School graduate, finished with 17 points, 3 assists, 0 turnovers. In this one, Reddish’s instincts were on point. Find the last Williamson dunk of the night. It came about because the 6-foot-8 Reddish passed up a decent look at a three, drove the left side, forced enough defensive action that he could make a little dropoff to Williamson for another highlight. “When he gets going, we get him the ball -- he turns into a different beast,’’ Williamson said, sitting at his locker. In that visitors’ locker room, sitting next to Williamson, was Mike Buckmire, a walk-on sophomore from Germantown Friends who was on the other side of Reddish onslaughts in high school back in the Friends League, when he was on that super team, with Mo Bamba and Brandon Randolph, among others. There’s a reason scouting types drool about Reddish, why his skill set is prized for any level, including the next one. When another team’s top two defenders get Barrett and Williamson -- “he kind of takes the pressure off them,’’ Buckmire added. Lately, he’s been taking the pressure off himself, too. Before practice with an assistant coach. At night with a teammate. Trying to take shots more at game speed, getting shots off quicker. “Basically whenever we feel we can get in there, we just go,’’ Reddish said of the extra gym time. This was his first game since the season opener against Kentucky that Reddish didn’t have a turnover. He also had three steals, always a part of his game. Reddish has met LeBron James, but that’s different than LeBron making a special trip to see his college team play. “I’m glad that he got to see us win,’’ Reddish said.